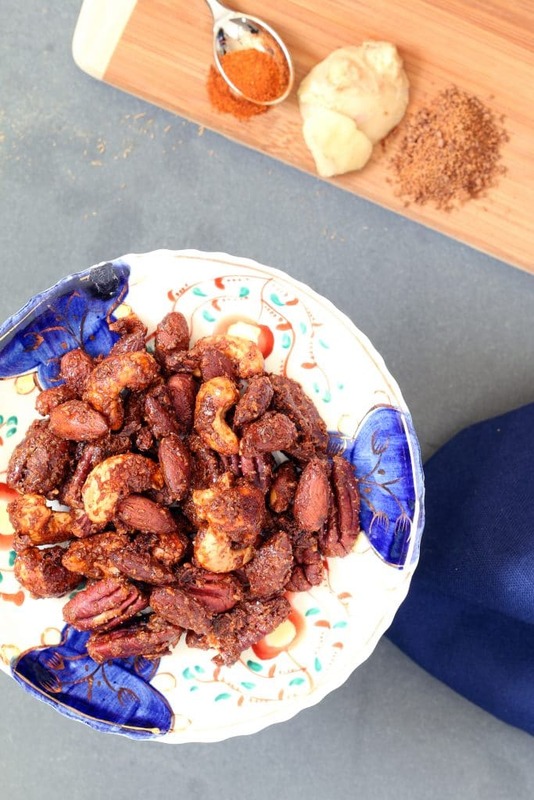 Sweet & Spicy Ginger Nuts satisfy your savory and sweet flavin’ cravin’ at the same time! A snack that packs a protein punch while serving up all the health benefits that ginger has to offer. In the past I have not been a huge fan of mixing savory and sweet, treats and heat, sugar and spice — not so nice! But my recipe for Candied Ginger changed all that. Since transitioning to a plant-based diet, my palate has opened up to so many new and wonderful flavors and flavor combinations. Now I can add sweet and spicy fusion to my list! Candied Ginger really opened the door, but my Sweet & Spicy Ginger Nuts closed the deal. 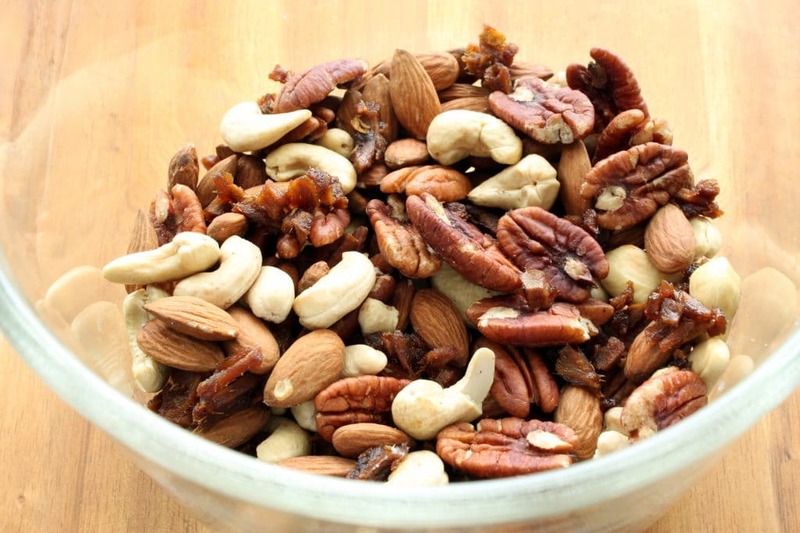 They are perfect for those hunger pains that come mid-day, after a workout or late at night. 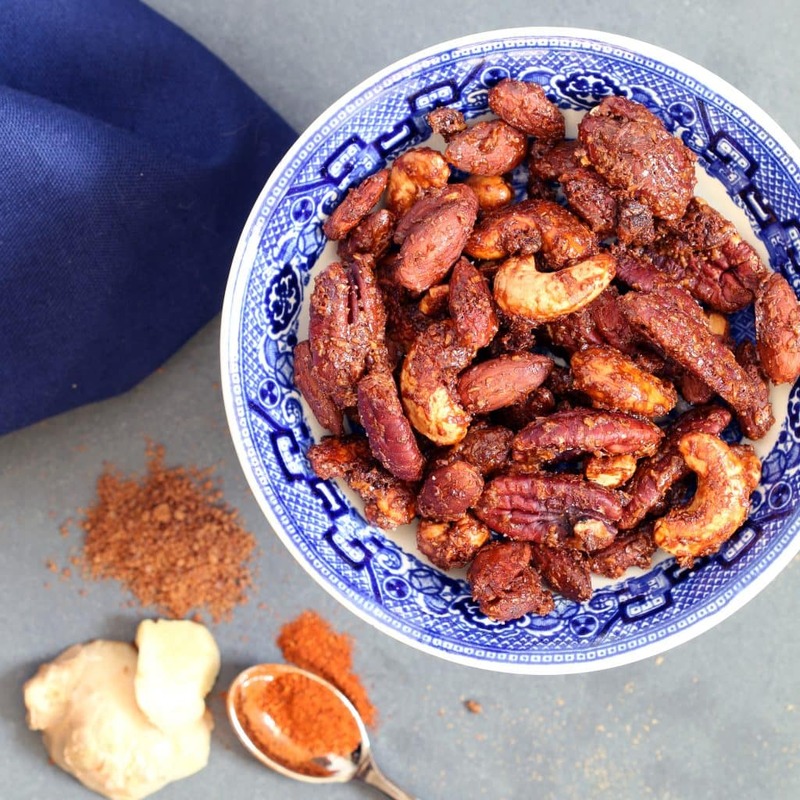 The caramel-like sweetness of the coconut palm sugar pairs perfectly with the light savory spices and ginger kick, while the nuts provide a great source of filling plant-based protein and healthy fats. So flexible! You can make your own candied ginger with my recipe and use the remaining syrup as well. Or if time is of the essence you can always buy candied ginger. 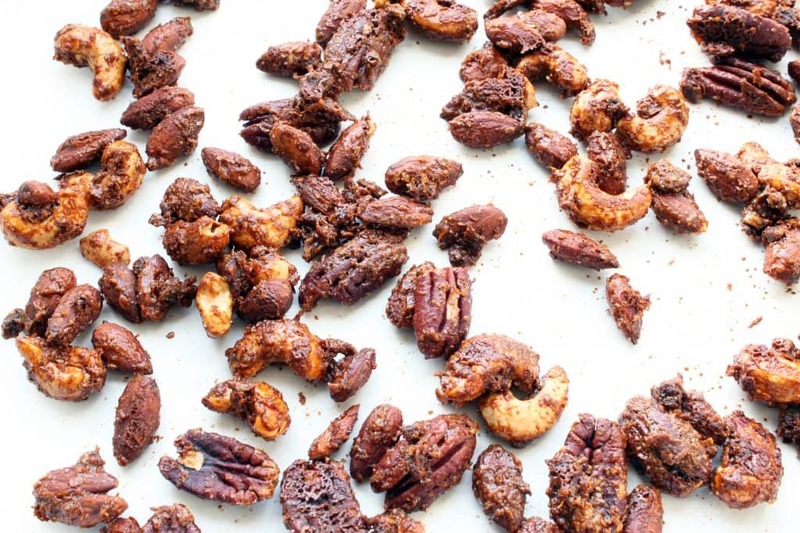 I combine almonds, cashews and pecans in the Ginger Nuts because I think those flavors just pair perfectly for this recipe. 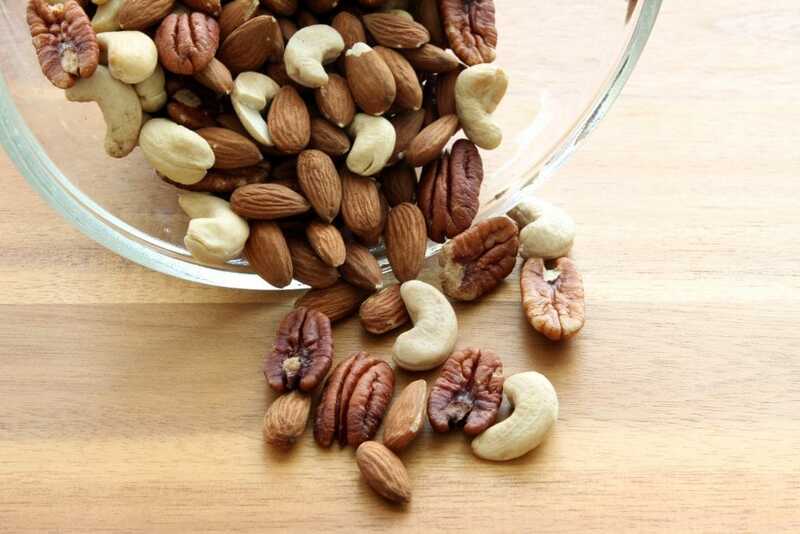 But if you are allergic or simply don’t care for one of the nuts I use, feel free to substitute more of the other nuts or perhaps some walnuts or macadamias. Ginger has so many nutritional and medicinal properties that I’ve started incorporating more of it into my diet (hop on over to my Candied Ginger post to see all that ginger has to offer). Next time you are in the grocery store stock up on some ginger. It will keep up to six months in an airtight container in the refrigerator. Leave the skin on and just cut pieces off and peel them as you need them. So what are you waiting for?! Time to go nuts!! 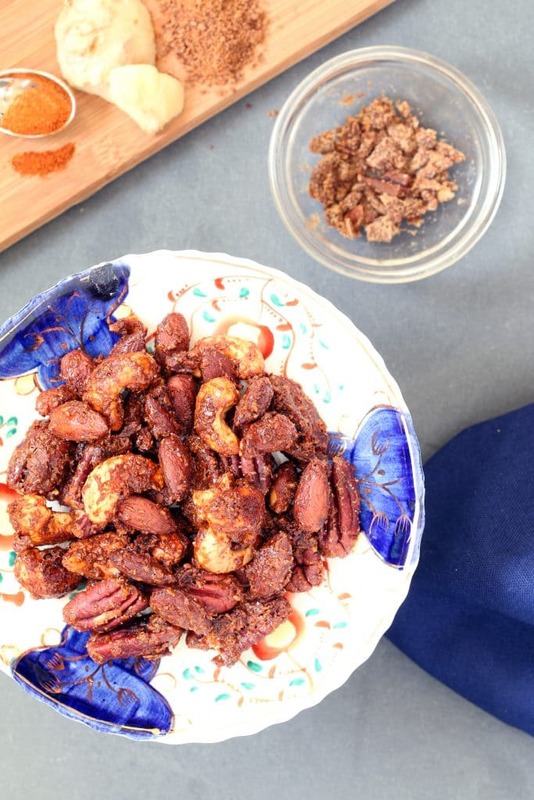 Sweet & Spicy Ginger Nuts satisfy your savory and sweet flavin' cravin' at the same time! A snack that packs a protein punch while serving up all the health benefits that ginger has to offer. 1) In a small mixing bowl combine golden flax meal, ginger syrup, coconut oil, sea salt, cayenne, paprika, garlic, and onion powder. 3) Spread mixture in a single layer on a parchment lined baking sheet. 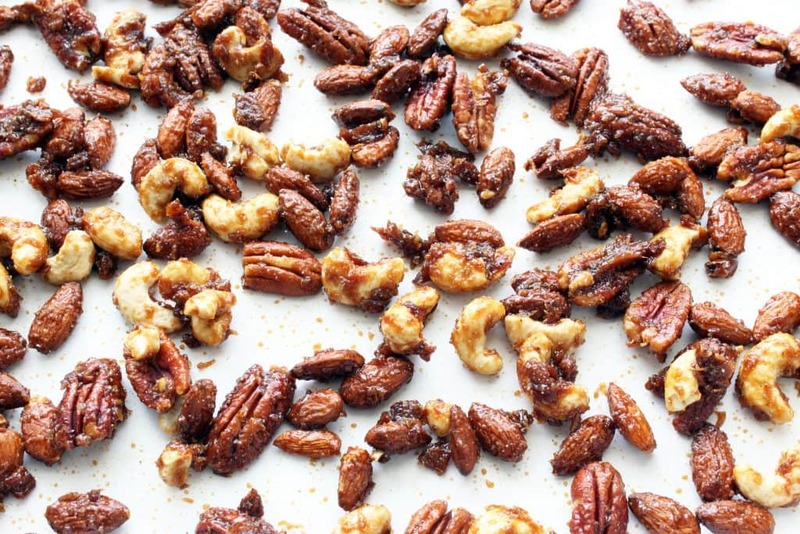 Bake at 300 degrees Fahrenheit for 35 to 40 minutes (flip nuts over after 20 minutes). Place on cooling rack to cool. Store in an airtight container. 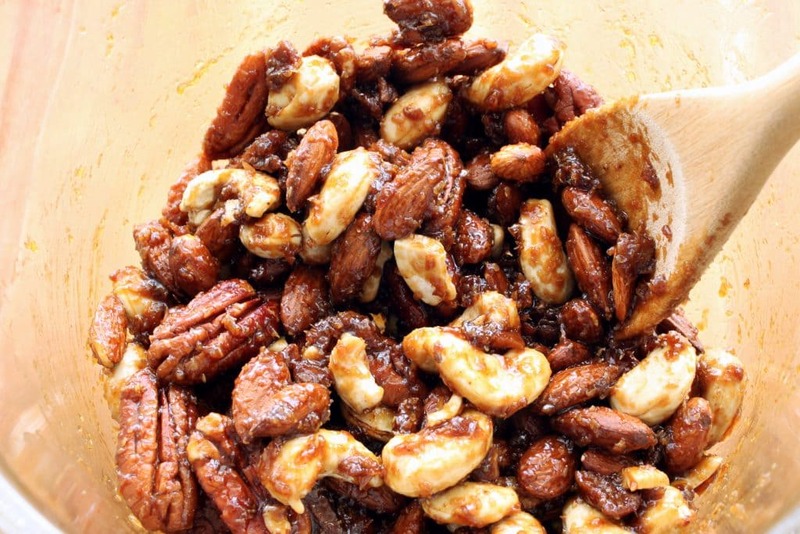 Sweet & Spicy Ginger Nuts make a great snack or topping for your favorite salad! Just found your website today. Oh. My. Gosh. I am in LOVE! I live overseas and don’t have access to Golden Flax meal. Is it necessary for this recipe? 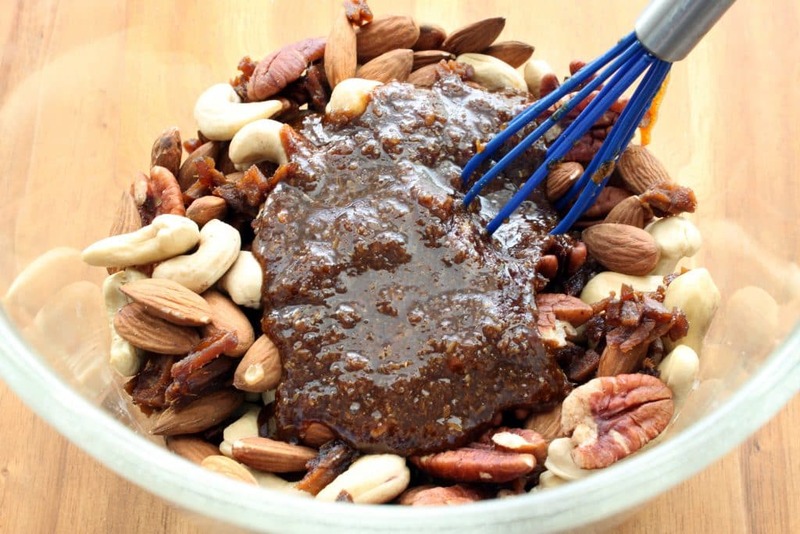 I do a lot of nut recipes, so I’m guessing it’s more for nutritional purposes, but if I don’t use it, should I decrease something else? Thanks so much. Hi Lois! Thank you so much and welcome!! I’m so happy you like what you see 🙂 You could substitute almond meal/flour in place of the flax. I use it because I feel like it helps the coating to stick and rounds out the flavor. I hope this helps!